Some of those who have “betrayed” Ford are now under investigation, the Arkansas Republican said. Cotton said Sen. Dianne Feinstein’s office will be investigated for the leak of Ford’s letter accusing Kavanaugh, a message Ford had explicitly requested be kept confidential. Cotton told CBS’s “Face the Nation” that Ford’s lawyers will face a Washington, D.C. bar investigation for allegedly not informing her that Senate Judiciary Committee staffers were willing to travel to California to interview her about her allegations against Kavanaugh. “Those lawyers are going to face a D.C. bar investigation into their misconduct. Dianne Feinstein and her staff are going to face an investigation for why they leaked that. 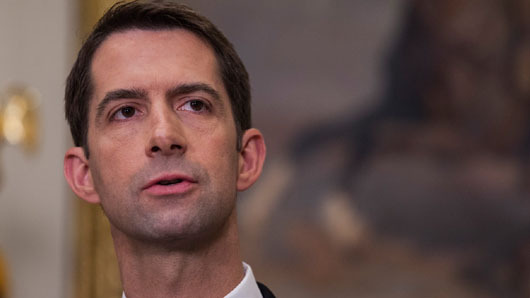 All of this could have been done discreetly, it happens hundreds of times … hundreds of times every year in the Judiciary Committee,” Cotton said. Feinstein, who received Ford’s letter in July, has denied any involvement in leaking it to the press. During her Senate testimony on Sept. 27, Ford revealed that she was unaware Judiciary Committee staffers had offered to meet her in private in California, which would have avoided a public hearing. Ford’s lawyers had apparently not informed her of the offer. The FBI’s investigation into allegations against Kavanaugh is unlikely to bring any new evidence to light, Cotton said, adding that the Judiciary Committee has already conducted interviews and/or received letters from witnesses to the alleged assault. “We already know what everyone at the party has said,” Cotton said, adding that the investigation will likely make a few senators more comfortable about voting to confirm Kavanaugh.